Initial consultation, assessment and planning will occur with one of our Dentists; the options appropriate to your case will be thoroughly discussed with you. Preoperative pictures and tooth shades may be taken and the smile design process is initiated. Impressions may be taken to allow our ceramist to provide a diagnostic wax up, this will physically allow you to visualise the intended outcome. In addition, we can use digital imaging to show you pictures of the desired outcome. A horizontal smile line is most attractive. An imaginary horizontal line through both of your pupils and another horizontal line between the tips of your canine teeth should be parallel. Even when these lines are not coincident, the illusion of horizontal alignment should be created. The most attractive smiles have mid line symmetry. The human eye can easily detect any difference in the size and shape of your front teeth. Creating mid line symmetry produces the perfect looking smile. 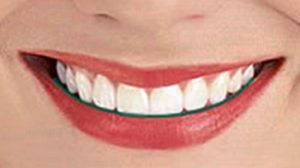 The smile line connects the biting edges of your top teeth. The most attractive smiles possess biting edges which gently follow with the curve of the lower lip. The gingival outline should follow the upper lip and be symmetrical. Only pink triangles should be seen between teeth. 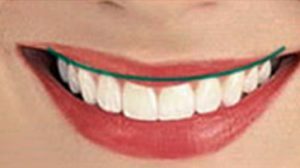 The gingivae provide an enhancing frame to your teeth. The golden proportion phenomenon is present throughout nature. The ratio 1.6:1:0.6 indicates the amount of tooth surface that should be seen when looking directly at a smile. This is the starting point of reconstruction and smile design. The most attractive smiles possess teeth with a width to height ratio of 0.7:1. Embrasures are the natural triangular spaces between the tips of the teeth. Attractive smiles embrasures are smallest between the front teeth and increase in size. Feminine smiles have rounded embrasures, whilst masculine embrasures are square. Smile Cliniq will provide you a list of your treatment options, projected time scales and costs. Let us transform your smile into the smile of your dreams. Porcelain veneers – The veneers are matched to the natural shade of your teeth. Our Dentists can instruct the laboratory technician to add in natural translucency, lines and irregularity to simulate a more natural look if the patient wishes. From £550. White fillings – Smile Cliniq uses highly aesthetic, strong and durable composite filling material from Venus Diamond and G-ænial that result in fillings that look natural as well as being long lasting. The fillings are shaped into pits and fissures, to achieve a natural looking result. Some patients may also wish to replace old existing amalgam (silver/black) fillings with white fillings. From £60-£240. Porcelain white crowns – Depending on the type of material used, crowns can be made to look as natural as the rest of your teeth. To achieve a beautiful smile, materials such as emax and zirconia are recommended. From £450. Teeth whitening – Whitening your teeth will significantly brighten up your smile and give you a younger and healthier appearance. There are two ways to whiten teeth; either the take home trays option and in-house bleaching option. To find out more about teeth whitening please visit our tooth whitening page. From £350. At Smile Cliniq dental practice, we also treat cases where the patients’ needs are more complex in some cases requiring several disciplines of dentistry including crowns, veneers and implants. In certain cases we may opt for pre crown/veneer treatment orthodontic treatment to reduce the amount of drilling to the tooth (tooth destruction). Creating a beautiful appearance is important, but Smile Cliniq also believes that retaining functionality; such as a comfortable bite when eating and speaking is a crucial factor when planning treatment. 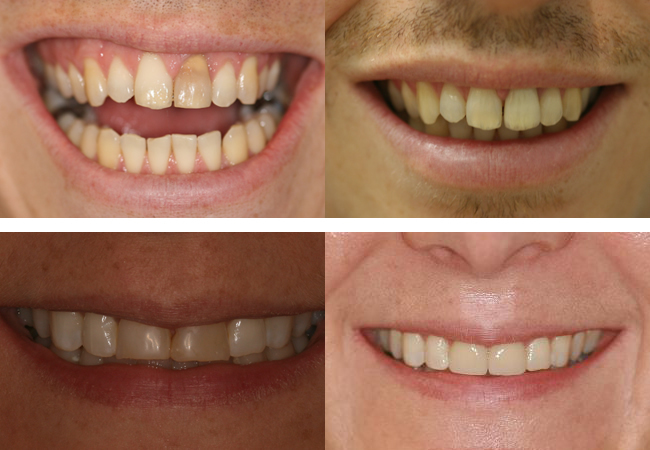 If you would like to know more about Smile Design and Smile Makeovers offered at our dental practices in London, feel free to contact us for a FREE consultation.